Wish there was a real screen like the more expensive Clavinovas. We all know that the name Yamaha is synonymous with top quality piano and keyboards; and, with motorcycles! (Odd combination – I wonder if they are actually made by different divisions of the same company). Pianos have changed so much over just the last decade; few companies have stayed in the forefront of re-designing their products to meet the many trends and technological challenges, as Yamaha has. Yamaha clearly has not lost its competitive edge. In the world of digital pianos, let’s take a look at the new Yamaha Arius series and particularly at the Yamaha YDP143 model as an example. The YDP143R is available in two colors (R) is for Dark Rosewood with gold pedals and (B) is for Black Walnut with silver pedals. The model features Yamaha’s proprietary Pure CF Sound Engine with large-ranging sampling abilities. This 88-key piano keyboard provides a heavier touch in the low end and lighter touch in the high end in the integrated “Graded Hammer Standard (GHS)”. The benefit to this is that it mirrors the touch you’d find on a traditional acoustic piano. The pedals are unique in that the “Stereo Sustain” pedal samples provide mellow reverb when the damper pedal is pressed. The digital library comes with classic piano based songs to assist new and intermediate players in learning the instrument using the accompanying book, while playing along. Or, the piano can act as a jukebox, playing on its own! With built in recording capabilities you don’t have to hassle with outside equipment to capture your sessions. It is capable of recording up to 2 separate tracks that can be overlapped to play simultaneously. The output file is in the SMF Format which is the widely used Standard MIDI file; allowing playback on most computers. Yamaha has intuitively (in keeping up to date on all new technology) issued what they call the “Digital Piano Controller” app for iPhone. Even their own sales material states that the app is quicker to access many of the features and settings, than the piano’s own controller. And, of course, you can record that way as well as add another instrument. A feature I can’t imagine living without, and one that is only available on Yamaha pianos is the unique headphone device. They call it a “Stereophonic Optimizer”. Within the headphones, it has the ability to separate the sound from the piano – almost as if it is coming across in full surround sound – which is truly awesome in order to hear what a recorded sound would sound like (versus the live sound you are playing and listening to). They have another feature they call “Intelligent Acoustic Control (IAC)” which makes playing at a low volume less troublesome. It automatically adjusts the volume of bass and treble to the composition of a louder rendition with more depth. It also is intelligent enough to match those adjustments into your speaker system when played at the lower volume. Often, the wood thickness inside the actual piano cabinet can affect the highs and lows by blocking sound, or even pushing it through a wall where the building materials are quite thin. They have solved this too with their “Acoustic Optimizer” that regulates the flow of sound and tone regardless of where it hits the inside of the cabinet. You can connect the piano directly into your computer or smart phone. You have to buy a special Yamaha cord (UD-BTO1) or use a “Lightening USB Camera Adapter”. It can also be hooked up wirelessly. Once hooked up, you can interface with a variety of the many music apps available on the market. How does the Yamaha YDP143R compare to the former model? In those famous lyrics “the sound remains the same” (yes, I know, it’s “the song remains the same”) in the newer 143 model, versus its predecessor. With the praise Yamaha received for the sound features in the earlier model they decided to leave the sound features as they were. They did however make some other adjustments. 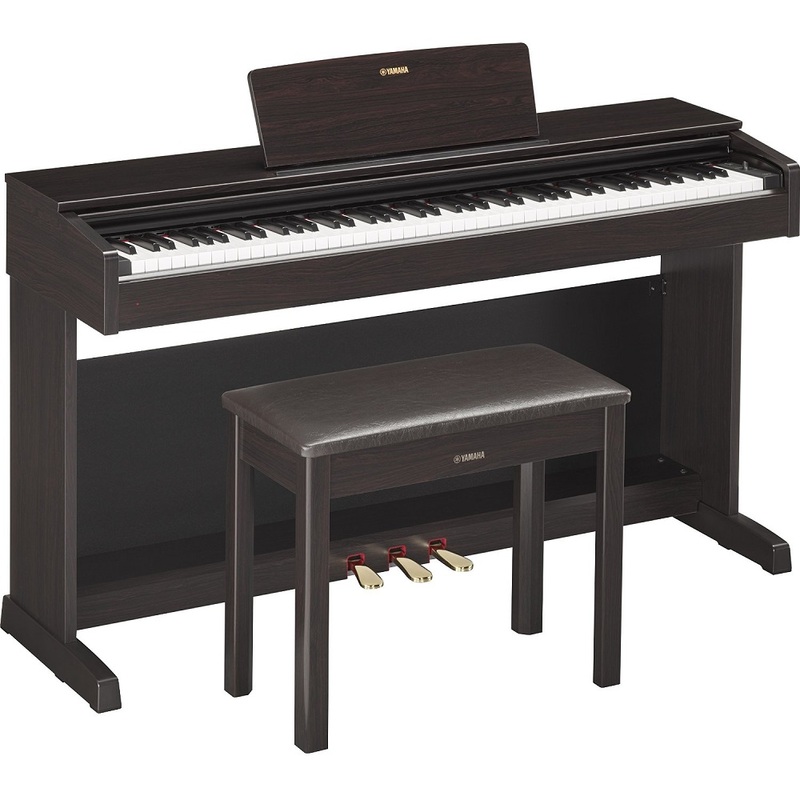 Borrowed from other models outside the Arius line, the Yamaha YDP143 now has their “GH3 action” which means, it has synthetic ivory keys and each key has 3 sensors that improve the piano’s response to your finger actions. They also took the gloss finish of the black keys to keep player’s fingers from sliding when hitting those keys. With the many advantages built into this wonderful instrument you’d think it would be extremely costly. Its not. It runs under $1,500 – with all it has to offer you’d be hard pressed to find a better product. The enhancements make even the beginner without much of a voice to sing about – make him/her sound THAT MUCH BETTER! While many feel the Yamaha YDP143 is best for beginner use, this Musician begs to differ. I feel the piano is as perfect for both pro-pianists on stage as it is for hobby players at home.